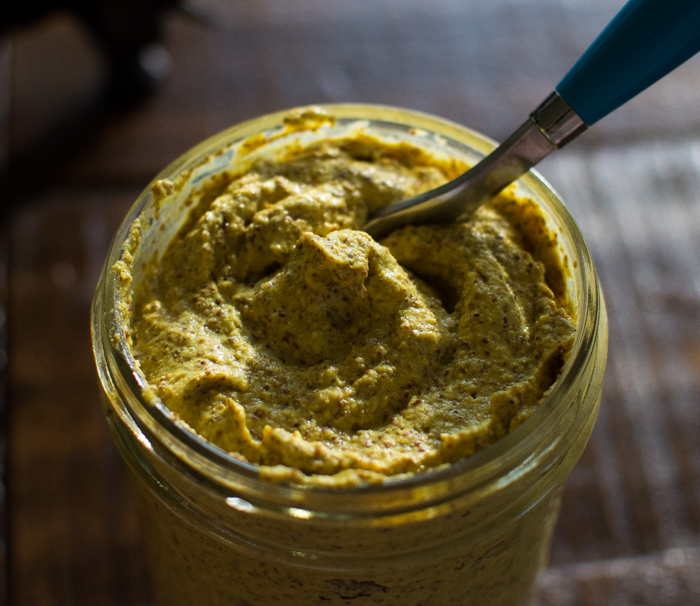 Have you been wanting to know how to make mustard? Of course you have! If I thought creating and composing new sauerkraut flavors was fun, let me just tell you the arena of mustard is just as exciting. I love mustard on unbelievable-earth-shattering sandwiches, to dip vegetables and fries into, a dollop whisked with vinegar for an amazing low-fat salad dressing, and the list will surely continue. Think of all the porter, stout, spicy garlic, and sweet mustards one can make! I am more than reasonably excited to make said mustards. 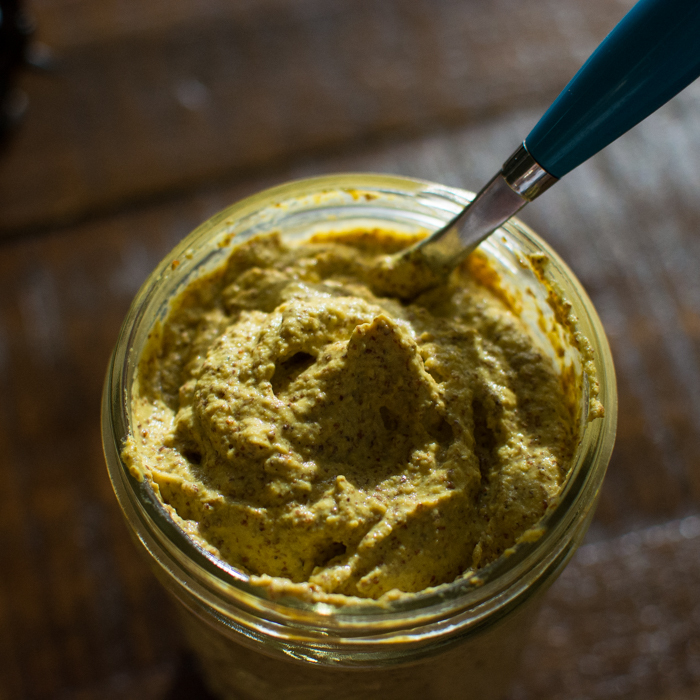 The best part about making homemade mustard is it doesn’t take as long as sauerkraut and while this isn’t truly a fermented condiment it is pickled and I think it will be quite easy to evolve it into one. 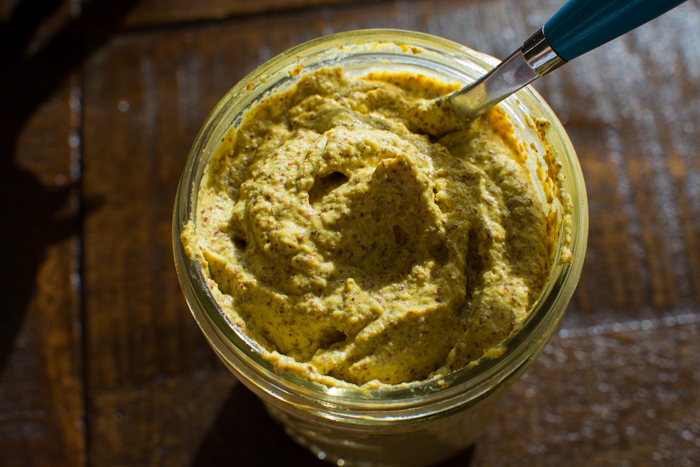 This recipe is for a whole-grain golden mustard. It’s mildly spicy and can be customized to your palette. The instructions are straightforward with simple already-in-your-pantry spices. It looks like an artisanal mustard you’d buy while wine tasting in the Columbia Valley and costs a fraction of the price because you’ve whipped it up in your kitchen. 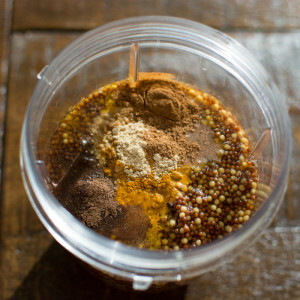 All it requires is soaking whole-grain mustard seeds in white wine vinegar overnight and then blending it with a few spices in a personal blender cup (like the Nutribullet). Transfer it to the fridge for a few days to allow the flavor to build momentum. That’s honestly the worst part. Waiting. Hopefully you still have a little mustard left to get you through the next few days. Wondering about shelf-life? Depending on how much you use and how often this batch could last up to 6 months and up to a year if you’re slow-going. The texture is thick like Grey Poupon though you can thin it out to your desired consistency. Spread it into rustic bread slices creating a gold canvas for sandwich creativity. Place vinegar and mustard seeds in 4-cup pyrex dish, whisk, cover, and let sit for 1 day at room temperature. Place a towel over it to keep light out or put in a cabinet. The next day empty soaked mustard seeds and vinegar into a tall Nutribullet cup. Add in sea salt, turmeric, allspice, cinnamon, ginger, and nutmeg. Blend until smooth adding water 1-2 tablespoons at a time—if needed—until the desired consistency is reached. Transfer to a 16 oz mason jar, cover, and let it sit in the fridge for 2-4 days before using. If you would like a MILDER MUSTARD opt for 1 cup of yellow mustard seeds instead of 1/2 brown 1/2 yellow. If you would like a SPICY mustard, go all in with brown seeds or at least 75%. If you would like more of a seedy look, play around with reserving a few tablespoons of soaked seeds and mixing them in after the blending process.